This is the tale of Maureen Folan (Aisling O’Sullivan), a middle aged woman who lives with her mother Mag (Marie Mullen). They endure a fractious relationship, with Mag never missing a chance to cut her daughter to the bone and her daughter responding in kind. Maureen has spent her life tending to the old woman and has never been in love. That is until she goes to a farewell party in their local public house and ends up coming home with Pato Dooley (Marty Rea). This brief tryst brings the crumbling relationship of mother and daughter to the edge of disaster. This is McDonagh’s first play and possibly his most powerful. It was originally produced by Druid in 1996 and launched the career of McDonagh. It is the first part of the Leenane Trilogy, with A Skull in Connemara and The Lonesome West both being produced by Druid a year later in 1997. McDonagh has written eight plays to date but has now moved on to Hollywood, writing and directing films such as In Bruges and Seven Psychopaths. His latest project Three Billboards Outside Ebbing, Missouri will be released next year and stars A-list actors such as Frances McDormand, Woody Harrelson and Sam Rockwell, so his career continues to flourish. 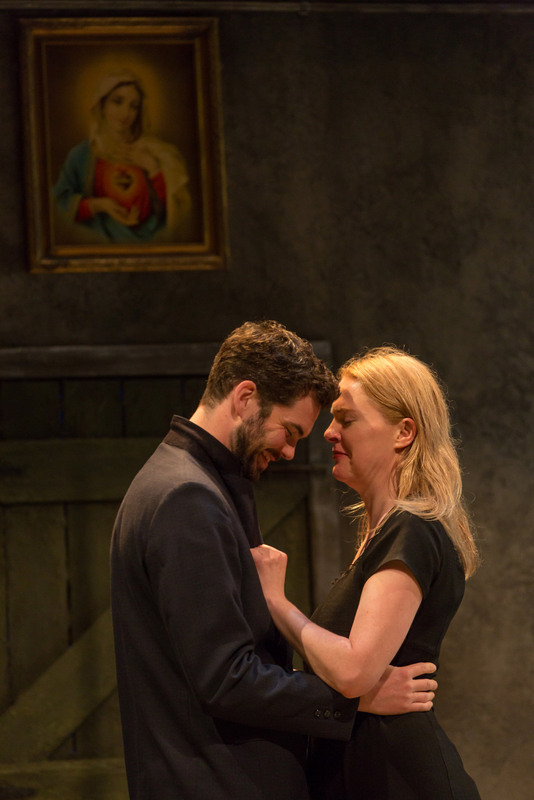 The set is a depiction of a downtrodden house in the west of Ireland, and set designer Francis O’Connor does an impressive job of capturing the small details such as the religious iconography, fluorescent lights and patches of damp on the wall. The rain beats off the kitchen window in some scenes, creating an atmosphere of isolation and dreariness. This production surprisingly shares one cast member with the original production, with Marie Mullen moving from playing the daughter to the mother. Mullen is a stalworth of the company and appears in much of their work. She is very impressive as the controlling mother, and knows exactly which strings to pull. Those familiar with McDonagh’s oeuvre will know what to expect and it is a dark comedy similar to much of his work. There is an ever present violence that bubbles just below the surface and sometimes explodes on stage. While there are four cast members, this production is very much about the two women and both excel in this production. When they are alone on stage together, the tension rises and their complex relationship is quite absorbing to watch. This impressive production has lost none of its impact and will introduce the work to a new generation. Cast: Marie Mullen, Aisling O’Sullivan, Marty Rea and Aaron Monaghan.